Today was quite the happy day of eats! Alexis is immersed in all things TRISM and Alchemy so it’s Natalie here bringing you along a summery day of delish adventures. Summer is winding down fast but I’m doing everything I can to enjoy the last days of freedom before classes start. Last week some friends and I headed up to Cleveland to stay with a friend and experience all that the city has to offer in 24 hours. It was a quick but oh so fun trip! 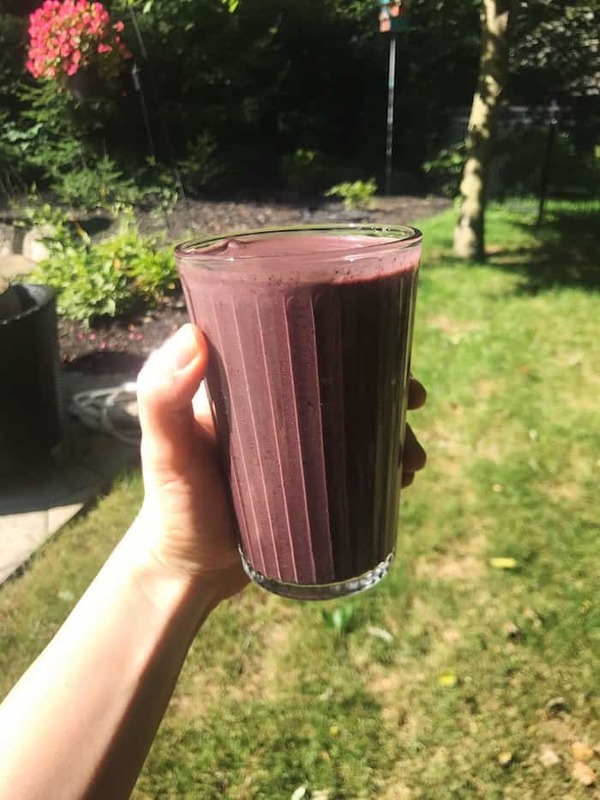 After a short little morning workout, I whipped up a smoothie with frozen bloobs, frozen cherries, tons of spinach, zucchini (can’t taste it!) arbonne protein powder and some homemade almond milk. After I snapped this pic, I topped it off with chia seeds to add fiber and fat for little extra staying power. Did the trick! 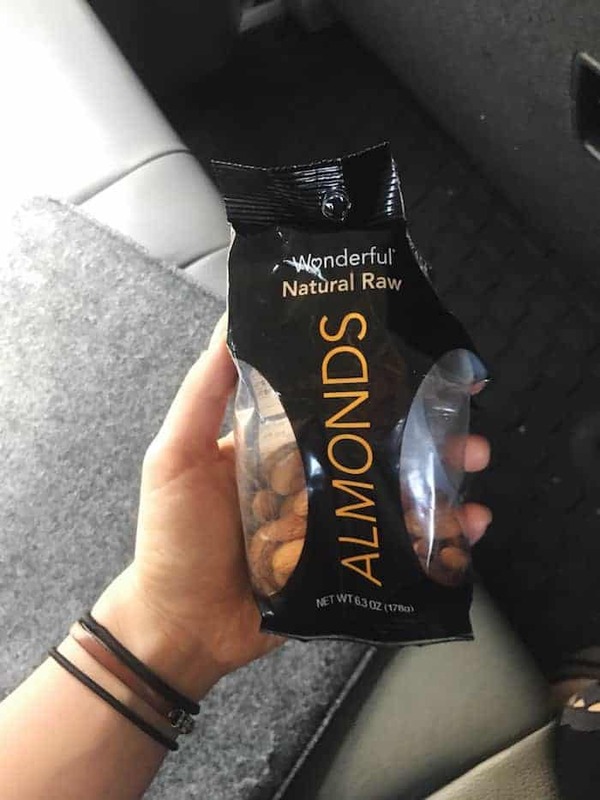 On the drive up I snacked on some almonds to keep my appetite at bay. We got to my friend Julia’s house and chatted while she packed us a picnic lunch (what an angel) and then we headed off to Lake Erie. I didn’t get a good picture of my plate because I was so excited to eat, but we had an awesome kale salad with roasted chickpeas and a big quinoa salad! Julia nailed it. On the side was tomatoes from Sunny’s garden. Summer perfection! Our time at the lake was short because we got rained out, so we packed up our gear and headed into town on a mission to get ice cream! We stopped in some cute shops along the way and I got this ginger turmeric steamer to sip on as we strolled to the ice cream shop. I got legit the BEST salted caramel pecan ice cream. Like I would consider driving to Cleveland every day just to have this. Was I hungry for this? Nah. Was I craving it? Not really. But part of intuitive eating is enjoying people and seasons and the things that come with them. And on this day it was ice cream that left me feeling so happy and satisfied. We ate this pretty close to dinner time so I didn’t really have an appetite when it was time to eat, but I had some of the pork and zucchini that Julia’s dad made. I love when other people cook for me. It makes dinner something I can relax and enjoy with pretty much zero thought. Always a win! Low quality pic because #reallife. I hope you’re out there intuitively enjoying these last sweet days of summer! Share the eats and adventures you’re loving in the comments, I’d love to hear! Your picnic lunch looks so good! I wish all my friends were healthy eaters too – that spread you had would’ve been amazing! Im going to miss summer picnics once Fall comes around. I think it’s safe to say that you chose the best flavor of ice cream! omg your ice cream looks UNREAL. and i still haven’t managed to have a picnic yet this summer, but it’s on my list! I love that you mentioned part of intuitive eating being enjoying people and seasons too! You’re totally right. Sometimes, I go out with friends and eat something special or indulgent that maybe I didn’t even especially want, but I feel so satisfied just getting to enjoy it with my friends and share in the experience. And dang does that flavor sound delicious!! It’s like the perfect tie between summer and fall since it’s nice and refreshing, but the flavor has a little bit of a fall vibe to it. Julia sounds like such a gem! That lunch looks absolutely amazing. None of my friends really cook so I’m usually the one that has to make the food haha. Right!? Food is such an experience and it’s so fun to enjoy it with friends!! I have never tried adding zucchini to smoothie! gotta try it soon! That and frozen cauliflower give it the best texture! Having so many veggies with breakfast always makes me feel awesome! Such a sweet little picnic, and your food looks great! I’ve been wanting to get some friends together for a picnic all summer, and we just haven’t made it a priority… I’m gonna have to get on that!! Gosh I wish we had places like Alchemy to eat where I live!